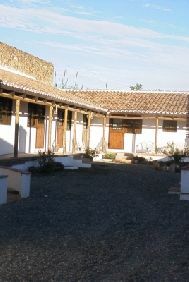 Cortijo Carranque has been lovingly converted from the old farm buildings to combine the beauty of the original stonework with the comfort of modern living. 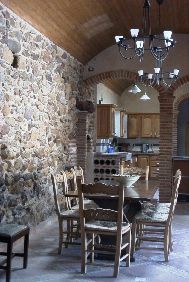 (La Granja) now converted into a spacious family kitchen/dining room, with beautiful old stone walls and vaulted ceiling. There is a small chapel at one end which guests are welcome to use for private prayer or meditation. The barn opens out onto the Moorish-style Cloisters, at one end of which is a large covered seating area which is the main "living room" during the summer months. Being totally enclosed, this space provides a good play area for children. There is also an Outdoor Dining Terrace with built in BBQ for those relaxed Al Fresco meals in the cool of the evening. The large unusual Swimming Pool is in a separate enclosed garden with views across citrus and olive orchards to the surrounding hills. It has its own covered seating area, converted from the original cow-byre, together with a swing seat and, of course, sun-beds for the sun worshippers. 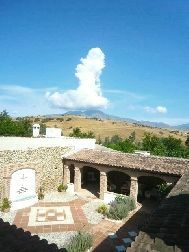 The property sits in a loop of the “Rio Grande” river, surrounded by Citrus orchards, while on the far side of the river networks of trails lead over the hills to the nearby farms villages and towns, providing walking to suit all tastes and abilities, from a brief stroll by the river, to day-long hikes. 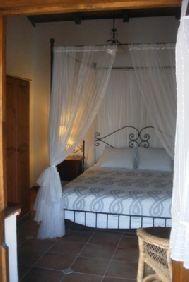 Note: In addition to the main guest wing of the house there are two self-contained 2 bedroom cottages, normally reserved for people on longer stays or sabbatical, but sometines available to other guests. Please feel free to ask if you would prefer a cottage, or need overflow space for a larger group.